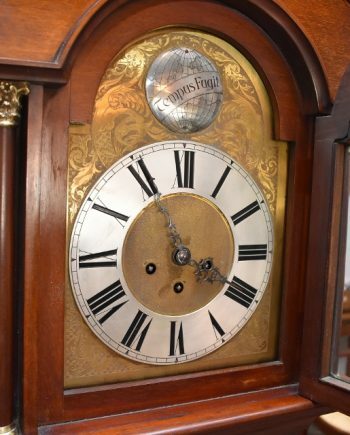 Antique Grandfather, Longcase and Tall Clocks for sale. Antique grandfather clocks are also called antique longcase clocks or tall clocks. An antique grandfather clock ranges in sizes but are normally eight feet tall. The first longcase clock was made in London by William Clement a British clockmaker in the year 1680. It is used mainly as an antique or for decorative purposes. A grandfather clock features a casing made of high-quality hardwood with elaborate paintings and carving decorations surrounding the clock face. Inside there are cables which support the weight of that clocks inside parts. Depending on the style you are looking for your home, the size of where you want to place it, chiming options and nighttime chime shut off options and your budget, there is a grandfather antique clocks that matches your personality. 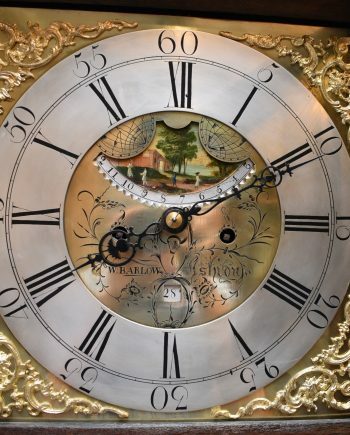 These antique longcase clocks don’t just tell time but also show how you appreciate design. They have a very high life expectancy and if well taken care of, they will serve you for many years. It is fine furniture that will be passed from generations to generations and it has maintained its originality since it was first designed. Concerto Triple Cable Driven Chime Clocks – To raise weights that power the clock, the arbors are wound once a week. It has an option to turn off chime at night time. Quartz Floor Clocks – These clocks use a battery for power to time, chime and pendulum movements. The battery lasts long because chime can be silenced or volume can be reduced depending on the room size. It is easy to replace the battery. Westminster Chain Driven Chime Clocks – To raise the weight that powers the clock, this uses chains that need pulling once a week. During the course of the week, the weights drop down again. Moon Dials – This offers an astrological correct moon dial. Westminster Cable Driven Chime Clocks – This uses a key that wounds during the course of the week to raise weights that power the clock. Chimes can be manually turned off. We have antique grandfather clocks for sale in various sizes. If we don’t have a specific tall clock you are looking for, we will source them for you. We are located in Perth, Australia. Our products are available nationally and internationally. We ship to many countries, including Scotland, New Zealand, France, USA, and the UK.